Two people were killed in an accident involving two cars on the Nojoqui Grade south of Buellton. [Update: Feb. 1, 2019, 4:30 p.m.] The Sheriff-Coroner’s office has released the identifies of the people who died in the Thursday car crash at Nojoqui Grade. They are Aura Orfelinda Guerrero, 48, of Porterville, who was driving the Honda Element. The passenger in the Jeep was Richard Jon Larson, 74, of the Buellton area. A report from the California Highway Patrol on the incident corrects Honda driver’s age and states the reason she spun out has not yet been determined. The injured woman’s age is corrected to 65 years old. 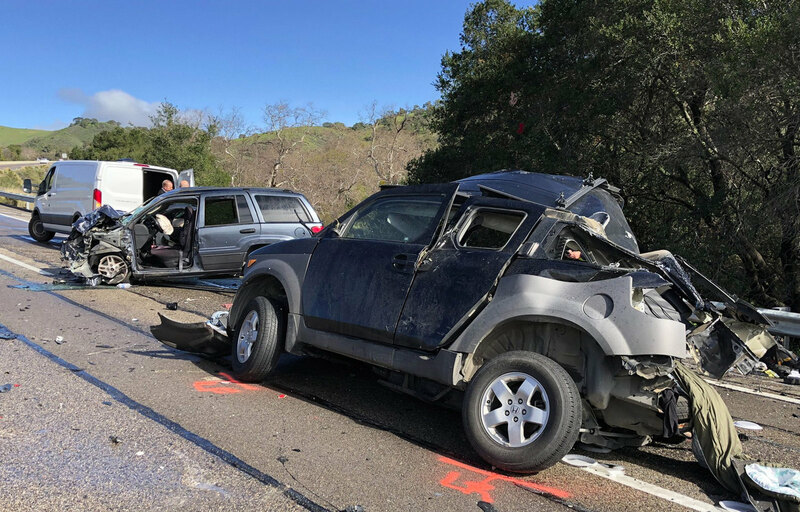 The 101 was closed for about two hours and reopened by 2:30 p.m.
Two vehicles collided on the Nojoqui Summit around 12:30 on Thursday afternoon, resulting in two fatalities, the Buellton office of the California Highway Patrol reported. In the accident, a Honda Element traveling southbound on Highway 101 apparently hydroplaned across the center divider, County Fire spokesperson Mike Eliason said, colliding with a Jeep Cherokee heading north. The Honda driver, a woman in her late fifties, and the male passenger in the Jeep, in his seventies, were both killed on impact. Firefighters used the “jaws of life” to extricate the woman driving the Jeep from the wreck, who is also in her seventies. She was flown to Santa Barbara Cottage hospital in critical condition by helicopter. A dog in the Jeep was also killed. The northbound freeway lanes were closed for about an hour but have reopened, the CHP’s Officer Larson stated. 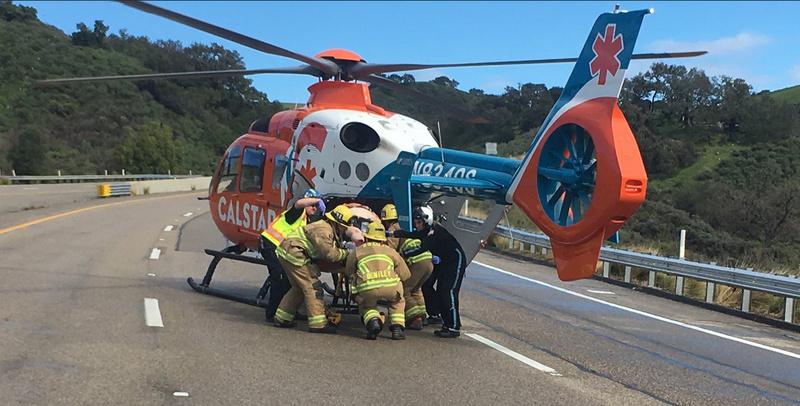 The surviving driver in a fatal two-car accident on the Nojoqui Grade is placed in a Calstar helicopter and flown to a hospital in Santa Barbara.